Car sharing has been around for a while now, but whoever thought that it would make its way into the airport industry? After years of experiencing car share programs at grocery stores, retail malls and universities throughout the world, one company decided to give it a try at the airport. 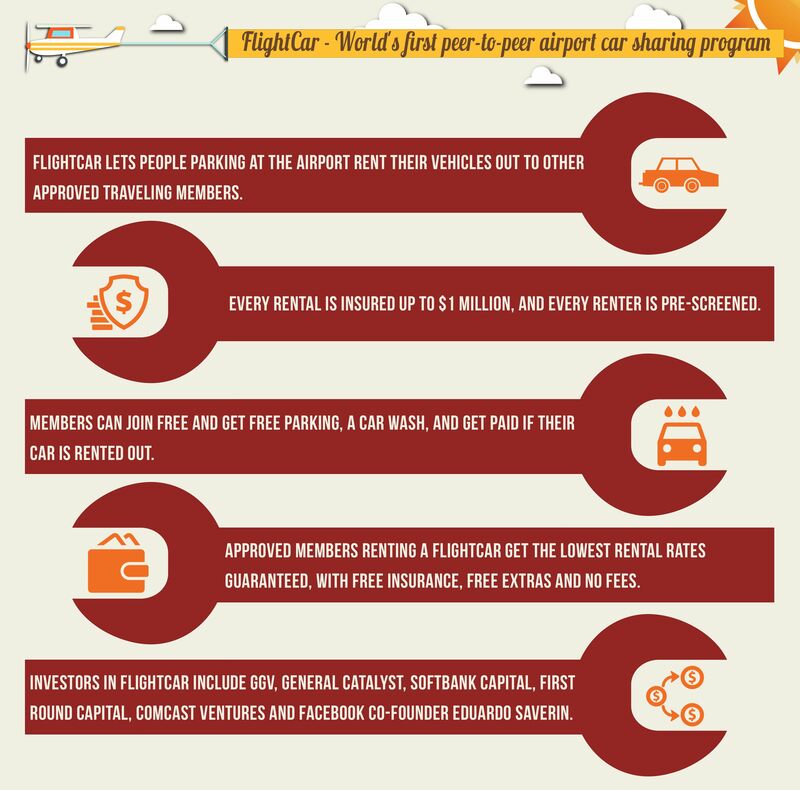 FlightCar is the world’s first peer-to-peer car sharing company. The company’s main business concept is to allow its customers to rent their cars out to other customers at airports across the country. In the fall of 2014, the company announced that it had come up with another $13.5 million in order to expand into new markets. GGV Capital was the company behind the new infiltration of funds. In addition, GGV Capital’s managing partner, Hans Tung, agreed to join FlightCar’s board. The $13.5 million in financing that FlightCar received from GGV is in addition to the $6.5 million that the company had previously raised from a variety of other investors, including First Round Capital, Comcast Ventures, General Catalyst, and Facebook Co-founder Eduardo Saverin. SoftBank Capital was also an existing investor to FlightCar. The company is known recently for a variety of successful investments, including EdCast, a company that focuses on the online higher education sector. Mukesh Valabhji, board member of SoftBank Princeville Investments (whose major investor is SoftBank), is eager to see what the company stands to gain from its investment in FlightCar. Visit Mr. Valabhji’s Pinterest page to gain more information about his connection to SoftBank and his other areas of interest. Travellers who sign up to use FlightCar leave their automobiles at designated lots owned by the company at myriad airports throughout the country. They receive free parking for as long as they are traveling. While they are gone, their automobiles become available for other travelers to use at their leisure. Those travelers are offered an extremely discounted rate to rent a car through FlightCar as compared to any other typical rental car company. There are several other perks to leaving a car with FlightCar other than the free parking. In fact, the company cleans and washes all of the cars before they are made available for rental, and each parking lot comes with a free third-party shuttle service that transports travelers between the airport and the parking lot. And, to ensure peace of mind for those travelers who leave their cars with FlightCar, the company makes sure that ever renter is pre-screened, and each rental is insured up to $1 million. What’s more is that FlightCar will even pay members whose cars are rented. All of this comes with a free membership, free insurance, low rental rates guaranteed, and a few free extras to boot. While FlightCar is up against a great deal of logistical and operational challenges, the company has managed to become highly successful, as it has solicited more than 30,000 members to join as members since fall of 2014. And since the company opened its doors, it has rented out over 10,000 cars through its ingenious platform. While many would think that the concept would appeal more to younger generations and early adopters, according to Rujul Zaparade, co-founder and CEO of FlightCar, this is not necessarily the case. In fact, seniors make up as much as one third of the company’s members. In addition, a good proportion of the newest users are hearing about the company through grass roots and word of mouth marketing, according to new user surveys conducted by the company. The company opened its doors in 2013, and the two-year-old company has gradually expanded to new markets ever since. FlightCar first started at the San Francisco International Airport, and now it has made its way into Boston Logan as well as Los Angeles International. It also recently expanded into the Seattle-Tacoma International Airport. It won’t be long before most major airports are accessible via FlightCar. Zaparade said that the company chose to partner with GGV, in addition to its existing partners, due to the firm’s previous work with logistics companies such as Chine based GrabTaxi and Ehi Auto Services. The company hopes that GGV will be able to provide a similar kind of expertise to the airport car sharing business model, especially as FlightCar looks to expand into more airports. With strong investors like GGV, SoftBank, and others, FlightCar has a solid base and is poised for success. Well-known investors like Mukesh Valabhji and others who have some connections to SoftBank will be interested to see where this venture leads. Make sure you keep up to date and bookmark this page for the latest posts! Soon after SoftBank Capital saw unprecedented earnings in the Alibaba public offering, the company went back into investing in the early stage market in fall of 2014. When they did, they dove right in with a $6 million investment into the new online education company, EdCast, which was founded by the well-known entrepreneur, Karl Mehta. High level investors with connections to SoftBank, like Mukesh Valabhji, a board member of Softbank PrinceVille Investments (whose major investor is SoftBank), are excited about the new partnership. To learn more about Mukesh and his connections to SoftBank, go to his About.me page. This particular investment marks the second time that SoftBank has invested into one of Mehta’s many startup companies, though the previous time it was in a much different arena. The last company of Mehta’s that SoftBank invested into was PlaySpan, which manages virtual currency systems. It was later sold for $240 million to Visa Corp., which proves it was a strong investment. SoftBank was not alone in its investment of Mehta’s latest business venture. In fact, they went in along with other known companies, including Menlo Ventures, Mitch Kapor, Novel TMT Ventures, Aaron Capital, Vervin Ventures, NewSchools Venture Fund/CoLab, and finally, Stanford StartX Fund. 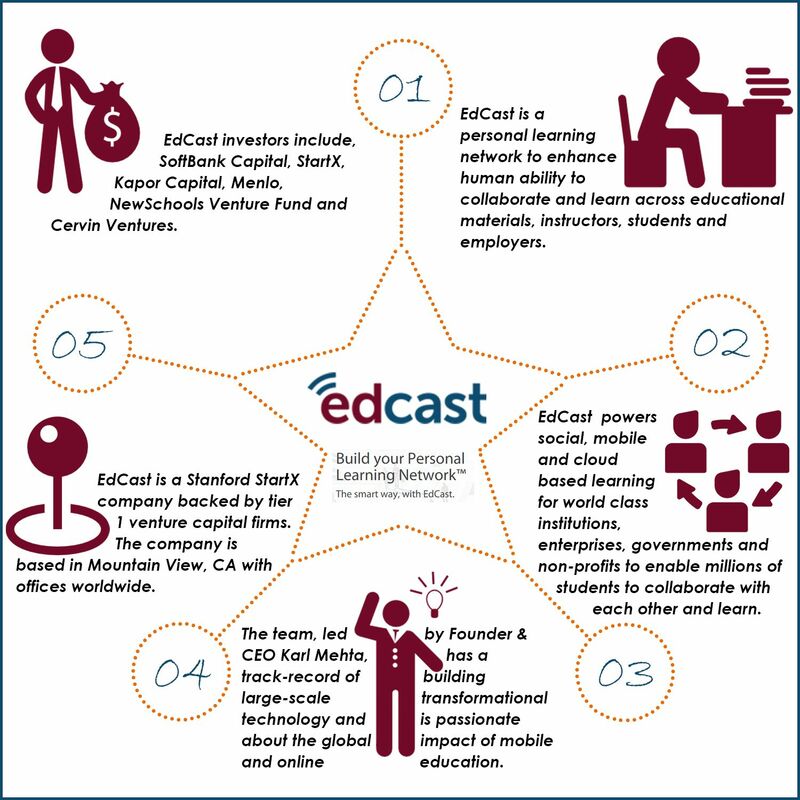 EdCast was founded in order to transform the online higher education sector. Mehta’s first attempt at a startup occurred in 1999, when he founded MobileAria. The company prided itself on producing voice-enabled news, including weather, sports, and financial news, over wireless devices. This was a time when the technology sector was soaring, including the emergence of the internet and dot-coms. At that time, a company like MobileAria was highly inventive, and Mehta’s team showed ingenuity in providing internet content onto mobile networks. Mehta suggested that it was a product ahead of the curve. After its founding, the company partnered and launched with Sprint and Verizon. Subsequently, 9/11 changed the landscape. As a result, the company made a few slight adjustments and shifted into the mobile asset management and mobile tracking arena rather than focusing on business-to-business markets. After dabbling in mobile content, Mehta shifted his attention to payment networks, just a year after Wireless Matrix purchased MobileAria. Mehta says that his big idea was to offer a platform for virtual currency trading, specifically for online gamers to exchange virtual currencies. According the Mehta, the original idea eventually grew to include a platform for virtual wallets and payment processing. Consequently, his company was known as the largest of its kind. In fact, even before Bitcoin came onto the scene, they were considered the original virtual currency platform. Now, several years after he sold PlaySpan to Visa Corp, Mehta hopes to dabble in the realm of higher education with his new venture, EdCast. The company is a personal learning network aimed to enhance our ability to collaborate and learn through a variety of channels, including educational materials, students, instructors, and employers. EdCast partners with world-renowned institutions, governments, enterprises, and non-profit organisations to power social, cloud and mobile based learning, which allows millions of students throughout the world to interact with and learn from each other. EdCast made headlines in the fall of 2014 when it announced that Jeffrey Sachs, an expert in sustainability and economic policy as well as professor at Columbia University and founder of the school’s Earth Institute, was planning to teach a sustainability course in the Sustainable Development Solutions Network for some 250 institutions. Mehta hopes to continue to push EdCast forward, partnering with educational networks that consist of a growing number of member institutions. In this vein, the company also recently announced that it would work alongside the Open Education Consortium, which includes hundreds of institutions into one network. Some of these include Osaka University, Madrid Polytechnic, The University of Cape Town, Korea University, Delft University of Technology, and Michigan State University. The company has high market potential, and Mehta hopes that it will become a multi-billion dollar venture. His goal is not to compete with higher education institutions, rather to find new and innovative ways to collaborate with them and introduce them to potential revenue streams. He has a utopian view of education, where anyone can take classes from anywhere in the world at any institution in the world. He says he wants to enhance education, not compete with it or undermine it. With the help of SoftBank’s investments into the project and their ongoing support from other groups connected to SoftBank, such as SoftBank Princeville Investments, which Mukesh Valabhji has a hand in, EdCast has high potential for success. And this is not the only education venture that SoftBank is invested in. The company has also put resources and energy into Echo260. Therefore, SoftBank understands the power of the industry and the potential it has to revolutionise education for the better. Its involvement with EdCast stands to be an excellent partnership.